I looked recently at our newspapers to find if any attempt was made in the coverage of the Aga Khan’s Diamond Jubilee (60 years of ascending the throne of the Ismaili Imamat on July 11) to show the importance of the landmark for Uganda Ismailis and even Uganda. What we got was the standard material about what the Aga Khan Development Network does in Uganda. Lots, but without that special connection, the story is like “Hamlet without the Prince”. Allow me to fill in two connecting - and connected - events which make the observance of the Diamond Jubilee so emotion-packed for Uganda Ismailis everywhere. The first is that one ceremony for the coronation of the Aga Khan had perforce to be performed on the grounds of the Ismaili jamatkhana (prayer house) in Kampala because of a last-minute objection by the Lukiiko against a non-Baganda king being coronated on public Buganda land. The original site chosen was Nakivubo stadium. Just in 10 days or so, volunteers came together from all villages to build the stage. Exams were very near, but we spent as much time as we could on the grounds of the jamatkhana and during the days of the ceremony itself. Because of the small size of the compound, the emotions could be seen on every face and on every mouth, the story was of the “miracle” that was actually happening. A band had come from Pakistan who wore Scottish kilts and played bagpipes. The old Aga Khan’s Begum joined in the celebrations at night. Fifteen years later (February 1972), the same jamatkhana was the scene of the Imam’s visit to his jamat and within just another six months, of the Asian expulsion. I was in Uganda that year collecting data for my dissertation at Stanford. The special Aga Khan angle in the expulsion starts with the fact that a majority of Ismailis had taken out Uganda citizenship on the guidance of the Imam himself and were rendered stateless in the verification exercise. Things were frantic as people went from one embassy to another to find a host country. Then the rumour that the Canadians were coming came true – and that then brings us the very special Aga Khan angle in the story. The Canadian mission set up in the Aga Khan’s IPS (Industrial Promotion Services) building, no less. In writing a book I came across the diary of the chief of the Canadian mission that had come to process us – Roger St Vincent. I took lots of extracts out of it to make the story come alive. The Aga Khan’s role is evident there and it also comes through in people’s own stories. My parents and elder sister and brother-in-law passed the Canadian interviews. Younger sister and husband wanted to stay on their accepted Uganda citizenship, but were scared off when gunmen appeared at their gate. They too secured Canadian visas. There is more of the Aga Khan angle! Unknown to most people, at the last week of the expulsion deadline, some 6,000 Uganda Asians were practically stateless as they had given up on their plans to stay on in Uganda on their confirmed citizenship, or were handicapped or of mixed race and practically abandoned by their families. Amin was ratcheting up the rhetoric: So you want to stay on in Uganda? Feel welcome to go dig the shambas. The UNHCR advised people to simply throw away their Uganda passports and report at their staging posts. The Aga Khan’s uncle Prince Sadruddin was the head of the HCR at that time. Within just a week or so, the HCR took away the 6,000 or so stateless Uganda Asians and sheltered them in centres in five European countries. At this time, UNHCR were dealing with 500,000 displaced persons from Southern Sudan and yet they devoted so much attention to us! The Aga Khan and UNHCR are accorded “hero” status in my book, along with Canadian prime minister Pierre Elliot Trudeau. There is a sequel even less often brought out: The 7,000 or so Uganda Asians (of all sects) that Canada took were the first batch of non-white refugees they were accepting, against sporadic opposition from the right-wingers. Within just six months or so of arriving in Canada, the refugees had found their own feet in business and professions, so much so that the next Canadian prime minister Chretien, was quoted as ruing why more of the Uganda Asians had not come to settle in his constituency. But there is more: Our successful resettlement in Canada encouraged Canada to accept thousands of refugees from Vietnam and that then contributed to Canada incorporating multiculturism in its law in 1987. And that encouraged His Highness the Aga Khan in establishing the Global Centre for Pluralism in Ottawa, rather than what at that time was seen as its “natural” setting – London. Quite evidently, the Global Centre is a celebration of what Canada is, and the Uganda Asian resettlement done under no other than the Aga Khan contributed to it! So much to remember in Uganda at this landmark jubilee of our Imam! Our Uganda jamat now consists of only 250 or so “original” Uganda Ismailis, swamped by 10 times as many “newcomer” Ismailis from India and Pakistan. I am quite certain as many Uganda Ismailis living in the diaspora countries will come for the jubilee ceremonies to make this a happy reunion. We can be sure many of the stories above will be remembered. Uganda’s “pluralism” too, under President Museveni’s repossession overture to the departed Asians will be celebrated then. What a win-win! The Honorary citizenship is a status bestowed by a country on a foreign individual whom it considers to be admirable or otherwise worthy of the distinction. His Highness the Aga Khan is set to receive an Honorary Citizenship of Kampala. The New Vision has learnt that KCCA has resolved to bestow the prestigious award to the Aga Khan during a special council meeting on Monday. Asked to explain what the award means, KCCA acting director of communication, Peter Kaujju told New Vision that the details will be revealed at a later stage. But he explained that this will be the first time that KCCA is giving out such an award to a reputable figure. The issue of bestowing the award to the Agha Khan was first brought to the attention of the KCCA councillors by the Lord Mayor, Erias Lukwago. Lukwago said KCCA had been requested to award the Aga Khan with either an Honorary Citizenship of Kampala or the Freedom of Kampala City Award. But the Lord Mayor did not reveal the person or office that asked KCCA to recognise the Aga Khan. Lukwago described the Aga Khan as a development partner of KCCA. New Vision has learnt that Prince Shah Karim Al Husseini Agha Khan IV, the 49th Imam of Nizari Ismailis will receive the award in recognition of the development roles the Foundation has played in Kampala, Uganda. But in his comment Jacob Siminyu, the Public Relations officer of the Immigration Department said that the Constitution is silent about honorary citizenship. Siminyu noted that they derive citizenship from Chapter three of the Constitution. “The types highlighted in the Constitution are citizenship by birth, adoption, naturalization and dual citizenship,” he said before asking Lukwago to explain honorary citizenship. The Aga Khan Foundation has operated a chain of multi-billion investments in Uganda for more than 70 years. The foundation portfolio includes investments in businesses, education, media, health, hotels and power generation. Lukwago said the Aga Khan will receive the award as part of the package of Uganda National Honours as he celebrates 60 years of accession to the throne of Ismaili Imamat. “I therefore request management to handle this matter and accordingly brief us on the modalities,” Lukwago said. The Aga Khan Fund for Economic Development owns the 250MW Bujagali Hydro power Plant constructed at a cost of USD 900 million and is building a sh100m hospital in Nakawa Division, Kampala. KCCA said the award will be handed over to the Aga Khan Foundation. Kaujju said the process of awarding the Aga Khan has started. “There is a proposal and records by the authority. The Authority asked us to prepare and arrange to award the Aga Khan upon his contribution to humanity and development in Kampala,” Kaujju said. He added that the KCCA’s technical team was already making the necessary consultations to see how the award will be bestowed to the Aga Khan. In the same vein, government spokesperson Ofwono Opondo described KCCA move as the right step in the right direction. “That is the practice in many cities. It is meant to demonstrate that if you are a person of distinguished profile, you will be recognized even in countries where you do not have citizenship,” Opondo said. He also expressed optimism that when the Aga Khan comes to receive his award, he will be accompanied by followers who may decide to invest more in Uganda. Efforts to speak to the Aghan Foundation in Uganda about the issue were futile as the official contacts picked from their website went through unpicked. New Vision has learnt that the Aga Khan holds another honorary citizenship of Canada, which was awarded to him by former Canadian Prime Minister Stephen Harper in 2009. President Yoweri Museveni is also said to hold an honorary citizen of the State of Washington in the United States of America. His Highness the Aga Khan, 49th hereditary Imam (Spiritual leader) of the Shia Ismaili Muslims and founder and chairman of the Aga Khan Development Network (AKDN) arrives this weekend as a special guest to Uganda’s 55th Independence Anniversary celebrations. This year’s celebrations will be held at Bushenyi Municipal Grounds under the theme, “Uganda’s freedom must be anchored in the spirit of hard work, resilience and Commitment”. President Yoweri Museveni in a special invitation to His Highness the Aga Khan thanked God for keeping him for all these years and for his contribution to Uganda’s development. The Aga Khan, who is also the founder and chairman of the Aga Khan Development Network, is this year, commemorating his Diamond Jubilee, (His 60th anniversary as Imam). “I understand that soon you will be celebrating the 60th anniversary of your enthronement as the spiritual leader of the Shai Imami Ismaili community. It is great that God has kept you for all these years and you have contributed so much to Uganda’s development in the past and present,” the President wrote. The Aga Khan was enthroned on 11 July 1957, at the age of 20. He succeeded his grandfather, Sir Sultan Muhammad Shah Aga Khan III. He will be decorated with the most excellent order of the Pearl of Africa medal during the Independence celebrations for his colossal contributions to Uganda’s development and to humanity. Through the Agha Khan Development Network, His Highness has made a lasting impact on the lives of thousands of Ugandans by providing access to high-quality education, health, hydroelectric power, media services (NTV, KFM, Daily Monitor, The East African), civil society, financial inclusion and hospitality (Serena Hotels). The AKDN has a long history in Uganda spanning over 100 years in Uganda and East Africa. Its activities in the country range from infrastructure projects including the Bujagali Hydroelectric Power Project, the country's first private hydroelectric power project, to a holistic early childhood education programme that operates in underprivileged communities, and from an advanced nursing studies programme to providing essential pharmaceuticals. Distributed by APO on behalf of State House Uganda. President Yoweri Museveni has received His Highness the Aga Khan and his delegation at State House Entebbe. The Aga Khan is in the country at the invitation of President Museveni as Uganda celebrates her 55th independence anniversary from British colonial rule. President Museveni and his guest briefly held discussions on matters of mutual interest. His Highness the Aga Khan will be a special guest during Uganda independence anniversary celebrations in Bushenyi during which he will be bestowed with a medal in recognition of his exceptional efforts towards the economic development of Uganda. The Aga Khan told his host that he was looking forward to attending Uganda’s historical event of her independence in Bushenyi district. His Highness, the Agha Khan is the 49th hereditary spiritual leader (Imam) of the Shia Ismaili Muslims. 8 October 2017 - Mawlana Hazar Imam arrived in Uganda this afternoon for his first Diamond Jubilee visit. The Attorney General, Hon. William Byarhanga welcomed him to Uganda, and Ismaili Council for Uganda President Minaz Jamal welcomed him on behalf of the Jamat. The AKDN Resident Representative Amin Mawji and other Jamati leaders were also present at the airport. The Attorney General, Hon. William Byarhanga welcomed him to Uganda and Ismaili Council for Uganda President Minaz Jamal welcomed him on behalf of the Jamat. The AKDN Resident Representative Amin Mawji and other Jamati leaders were also present at the airport. In a colourful ceremony at Entebbe airport, the Uganda Police Band played the Nashid al Imamah and the Ugandan National Anthem and Mawlana Hazar Imam walked past a Guard of Honour. Local dancers also performed a traditional greeting. Mawlana Hazar Imam is in Uganda at the invitation of His Excellency President Yoweri Kaguta Museveni. After leaving the airport, Hazar Imam called on the President at State House Entebbe. Tomorrow, he will accompany the President to a celebration of Uganda's 55th Independence in Bushenyi. While in Uganda, Mawlana Hazar Imam is expected to grace the Jamat with the first Darbar of his Diamond Jubilee year, which marks 60 years of his Imamat as the spiritual leader of the Shia Ismaili Muslim community. Kampala, Uganda | THE INDEPENDENT | The Aga Khan has arrived to join Ugandans as they celebrate their 55th Independence Day, October 9. He is a special guest at Monday’s celebrations in Bushenyi and will receive an honor for the economic contributions he has made to the Uganda. President Yoweri Museveni on Sunday received The Aga Khan and his delegation at State House Entebbe. Museveni and his guest briefly held discussions on matters of mutual interest. In the context of his hereditary responsibilities, The Aga Khan has been deeply engaged with the development of countries around the world for close to 60 years through the work of the Aga Khan Development Network (AKDN), writes akdn.org. The AKDN is a group of private, international, non-denominational agencies working to improve living conditions and opportunities for people in specific regions of the developing world. The Network’s organisations have individual mandates that range from the fields of health and education to architecture, rural development and the promotion of private-sector enterprise. What is enfolding is drama at world scale as some very high national honours will be conferred on the Aga Khan, and others announced in what is officially a State Visit. In consequence of this, Uganda is the very first country in the world the Aga Khan is visiting during his Diamond Jubilee year – July 11 2017 to July 11 2018. The government of Uganda is joining the Ismaili community – and Uganda Asians everywhere – in honouring the Imam for the 6o years of his reign. By so doing, government of Uganda is reinforcing the embrace of the Asian community’s role in Uganda’s socio-economic development in a pluralistic setting dear to the Aga Khan. Those with a sense of history will see in this an acknowledgment of the roles of the Ismaili community and the Asian community in Uganda’s development from the start of the Protectorate. It was under the guidance of the Ismaili 46th Imam Hassan Ali Shah Aga Khan I (the present Aga Khan’s grandfather’s grandfather) that Ismailis began migrating to East Africa. The great Allidina Visram, (“King of Commerce” in East Africa) was among them. Aga Hassan Ali Shah’s grandson Aga Khan III (present Aga Khan’s grandfather) took up the theme of the necessity to migrate to Afrika even more vigorously. Kampala’s first Ismaili jamatkhana was established at mid-1910s in Nakasero, not far from Allidina’s first shop. Some adjoining rooms were used as school, the first Indian school in Uganda. The modern buildings in Makerere Valley opened only in the early 1950s. The Aga Khan schools were the first among Indian schools to open up to Africans. It’s the Most Excellent Order of the Pearl of Africa Medal that will be bestowed upon the Aga Khan. It is Uganda’s highest medal in the form of a chain (10kg gold) given to Heads of State only. HH Aga Khan is being recognized as such. The present Aga Khan has two close personal relationships to Uganda. He never fails to recall in his speeches that one ceremony of his Takhtnashini (coronation) took place in Kampala (August 1957) on the grounds of the jamatkhana itself, as in a last-minute decision the Lukiko (Kabaka’s government) decreed that no non-Baganda king could be coronated on public Baganda land. In the second case the Aga Khan played a crucial role at the Uganda Asian expulsion (1972), by urging upon his friend Canadian prime minister Pierre Elliot Trudeau to come to the rescue of the stateless Asians, a majority of whom were Ismailis who had taken out Uganda citizenship under the guidance of the Aga Khan. The Canadian mission set up their offices in the Aga Khan’s Industrial Promotion Services (IPS) building, no less. If we bring in the fact that the Aga Khan’s uncle Prince Sadruddin played an even more dramatic role as head of the UNHCR ( High Commission for Refugees) in the last-minute evacuation of six thousand or so stateless people then the Uganda expulsion story is very much an Aga Khan family story and that is being recognized this week. The story continues after the expulsion. His Highness was one of the first Asian leaders President Museveni sought out to come and repossess his social properties (schools and dispensaries) and thus to show the Ismailis Uganda was again in the favour of the Imam. The Aga Khan reciprocated by rehabilitating the Nile Mansions into the iconic Serena Hotel and then in a major way by undertaking the construction of the Bujagali hydro project. Environmentalists had been thwarting President Museveni, abetted by the World Bank and none other than the Spirit of Bujagali who threatened to divert the waters. The opening of the dam (October 8, 2012) was a highlight day for the President as 260MW of power came on stream, cutting the brown-out time from 30 percent to 2-3 hours per week now and again to extend lines. His Highness Prince Karim Aga Khan - Diamond Jubilee, 1957-2017: Uganda Awards - By Vali JamalIt’s the Most Excellent Order of the Pearl of Africa Medal that will be bestowed upon the Aga Khan. It is Uganda’s highest medal in the form of a chain (10kg gold) given to Heads of State only. HH Aga Khan is being recognized as such. City Council of Kampala has already announced the award of the Freedom of Kampala City and the Parliament and Makerere University will confer awards that fall in their domains. The recognitions are to the Aga Khan first and foremost, but they are also a reiteration of President Museveni’s resolve that the Ugandan economy be as plural as possible after the nightmare of the expulsion. ALL Uganda Asian communities and even multinational corporations should exult at this, not just Ismailis. Vali Jamal, Kenya citizen, Uganda resident since 1946, BA Cambridge 1964, Assistant Secretary Uganda Ministry of Commerce and Industry 1964-67, PhD Stanford 1976 (data collected at Makerere 1972), Senior Economist, UN-ILO 1976-2001. Author: UGANDA ASIANS: Then and Now, Here and There, We Contributed, We Contribute. When he takes to the podium to be honoured today, it won’t be by accident or even a miracle; it will be tribute to decades of work and contribution His Highness Prince Karim Aga Khan IV has done in Uganda that have outlived many post-independent governments. 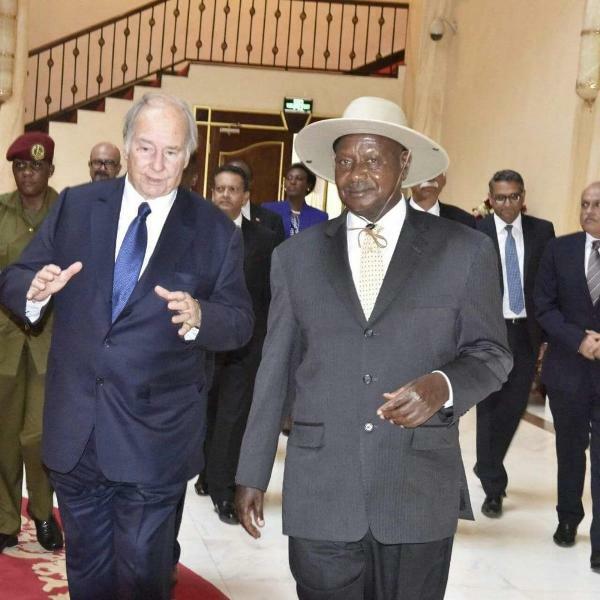 The Aga Khan, who is the Imam (spiritual leader) of the Ismaili Muslims, arrived in the country yesterday ahead of today’s 55th Independence anniversary and held a brief meeting with President Museveni and other senior government officials at State House Entebbe. Earlier, during a media briefing at the Uganda Media Centre, Presidency minister Esther Mbayo hinted on why Uganda was honouring His Highness the Aga Khan. “He will receive a special honour because of the immense economic contributions he has made to our country and indeed the whole world,” Ms Mbayo said. He will be decorated with the “Most Excellent Order of the Pearl of Africa” medal during the celebrations for his huge contribution to Uganda’s development and to humanity. The medal, according to the National Honours and Awards Act, 2001, is given to Heads of State and Heads of Government. A full citation, as dictated by law, shall be made clearly indicating the reason for the award during the celebrations. Past recipients include presidents Paul Kagame (Rwanda), Theodore Obiang Nguema Mbasogo (Equatorial Guinea) both awarded in 2012, Armando Guebuza (Mozambique) in 2013 and Julius Nyerere and Jakaya Kikwete (Tanzania) in 2007. His Highness Aga Khan has made outstanding contribution to furthering the understanding and progress of human development in Uganda and the wider East African region. Choosing to return to Uganda as he marks the Diamond Jubilee, or 60 years, in office as the 49th hereditary Imam (spiritual leader) of the world’s Shia Ismaili Muslims shows how much importance he attaches to Uganda and her people. In recognition of his exceptional efforts and contributions to human development and improving the social condition of societies globally, the Aga Khan has over the last six decades, received numerous decorations, honorary degrees, and awards from institutions and nations across the world. He has been deeply engaged in the development of countries around the world through the work of his Aga Khan Development Network (AKDN). He and his grandfather before him, Sir Sultan Mahomed Shah, have had a presence in Uganda and the region for more than a hundred years. The immense contribution of the Aga Khan and the Ismaili Imamat to Uganda has included social development (education, nursing, healthcare, civil society strengthening, and rural support), infrastructure development, tourism promotion, industrial promotion, financial services development, media for development and cultural development. The initiatives demonstrate the Aga Khan’s long-term commitment to the development of Uganda. In the last decade alone, the total development investment made in Uganda by the portfolio entities of AKDN, including resources of AKDN partner organisations and lenders, amounts to more than $1 billion or Shs3.6 trillion. In addition to delivering strong developmental outcomes, the AKDN agency companies are also among the highest tax-payers in Uganda today. Yet, the Aga Khan and the Ismaili Imamat draw out no financial returns from these investments as all financial surpluses are re-invested in development work. Throughout his 60-year period of Imamat, His Highness has, in partnership with government, tirelessly promoted development, working to improve the lives of people regardless of religion, origin, gender or tribe. His ambition has been to strive for world-class standards for all Ugandans and the region. A central feature of his unique approach has been to design and implement strategies in which the different agencies of his development network integrate their activities in order to reinforce each other’s efforts and impact. Take education as an example. The Aga Khan has long displayed a deep and unwavering commitment to Uganda. AKDN has been involved in education in Uganda since the 1930s when the first Aga Khan schools were established. Over the years, AKDN’s contribution to the education sector has expanded to include a continuum of services from early childhood education at the grassroots level, to high-quality tertiary education where students, teachers and school management all benefit from the various formation initiatives. Since its inception in 1993, the early childhood programme has increased the ability of more than 20,000 children from marginalised communities to access and succeed in primary and later schooling, through fostering pre-school environments in children’s formative early years. AKDN agencies also provide training, research, programme design and policy formation support to the government. His faith in this nation and the leadership of President Museveni led to the return of a number of Ismaili families who have now made Uganda their home. Under the guidance of The Aga Khan, the Ismaili community stands out today for its unstinting loyalty to Uganda and its enormous contribution to the economic progress of the country. Museveni welcomes The Aga Khan to Uganda at State House. Kampala, Uganda | THE INDEPENDENT | The Aga Khan has arrived to join Ugandans as they celebrate their 55th Independence Day, October 9. He is a special guest at Monday’s celebrations in Bushenyi and will receive an honour for his contribution to the social and economic development of Uganda. 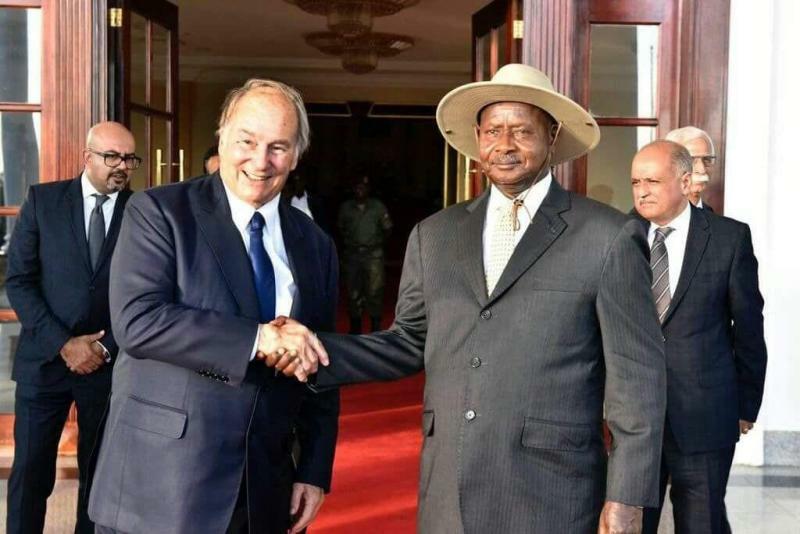 The Aga Khan was invited by President Yoweri Museveni. 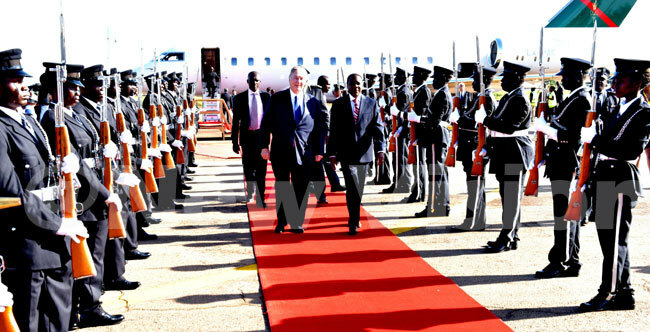 His Highness the Aga Khan, who is spiritual leader of the Ismaili Muslim Community, arrived in Uganda yesterday on a four-day visit as a special guest during the celebrations to mark Uganda’s 55th Independence from British rule. 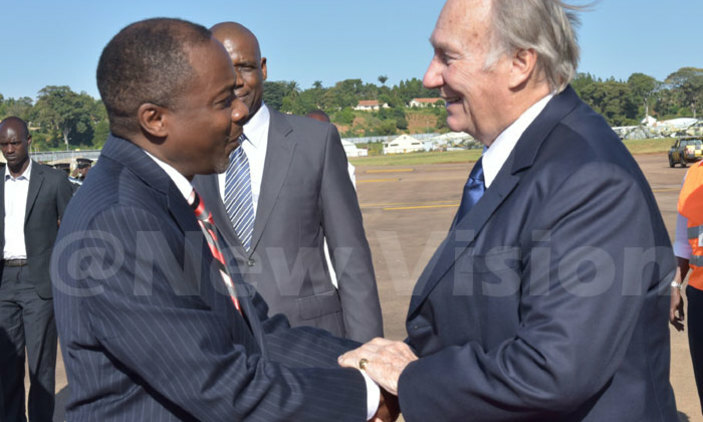 The Aga Khan, who was invited by President Yoweri Museveni, was received on arrival at Entebbe International Airport yesterday evening by the Attorney General, William Byaruhanga and other dignitaries. President Museveni later received His Highness the Aga Khan and his delegation at State House Entebbe. 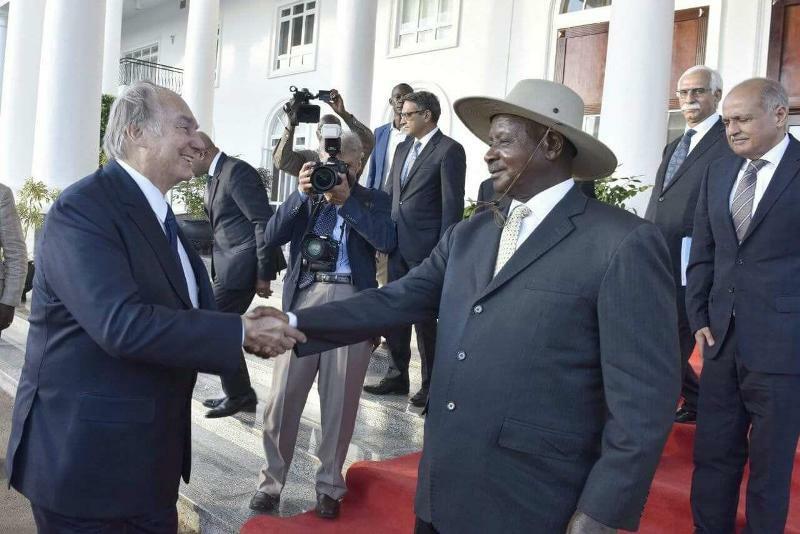 Museveni and the Aga Khan briefly held discussions on matters of mutual interest. 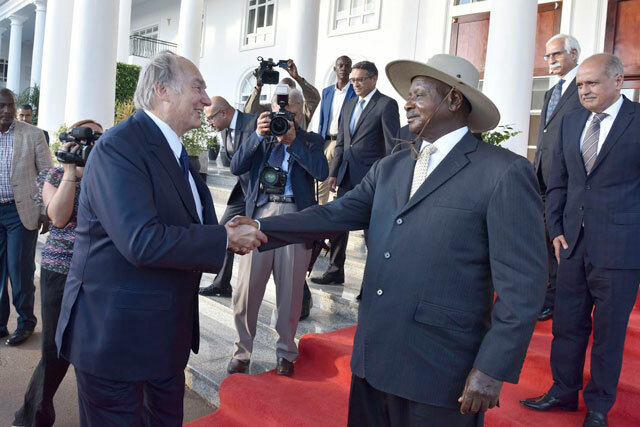 The Aga Khan will be a special guest during Uganda independence anniversary celebrations in Bushenyi district, during which he will be bestowed with a medal in recognition of his exceptional efforts towards the economic development of Uganda. According to statement released by the Aga Khan Development Network (AKDN) yesterday, the visit is part of a series of visits that coincide with the Aga Khan’s Diamond Jubilee, which began July 11. The Diamond Jubilee marks 60 years of his Imamat as the spiritual leader of the Shia Ismaili Muslim community. The Aga Khan became the Imam on July 11, 1957 at the age of 20, succeeding his grandfather, Sir Sultan Mahomed Shah Aga Khan. Upon his arrival at Entebbe Airport, the Uganda Police Band played the Ugandan National Anthem and Nashid al Imamah, following which the Aga Khan walked through a Guard of Honour. After leaving the airport, the Aga Khan travelled to State House Entebbe where he was received by His Excellency Preisdent Yoweri Museveni. His Highness the Aga Khan is the founder and chairman of the Aga Khan Development Network (AKDN) – a global network dedicated to improving the quality of life of all people that has made substantive contributions towards the development of Uganda. The Aga Khan Development Network (AKDN) has a long history in Uganda, working in education, healthcare, economic development and civil society, programmes supported by the government and other partners. The Aga Khan will also meet with members of the Shia Ismaili Community in Uganda as part of his itinerary. Posted: Sun Oct 08, 2017 9:21 pm Post subject: H.H. The Aga Khan arrival in Kampala on 8th October 2017. H.H. The Aga Khan arrived in Kampala on 8th October 2017. Chairman of the Aga Khan Development Network (AKDN) is expected in the country on Wednesday October 11 for a two-day official visit. The visit follows an invitation which was extended by President John Magufuli. The Aga Khan who is the Imam (spiritual leader) of the Shia Imam Ismaili Muslims is in the country on his second leg of his East Africa Tour. According to a statement issued by the Aga Khan Development Network he is expected to land at the Julius Nyerere International Airport around 10.30 am and received by Minister of Foreign Affairs and East African Cooperation Dr Augustine Mahiga. The visit is part of a series of visits that coincide with the commemoration of the Aga Khan’s Diamond Jubilee which marks 60 years as the spiritual leader of the Shia Ismaili Muslim community. “These include hospitals, schools, universities and financial institutions that serve people of all backgrounds and faiths,” read the statement. Aga Khan is the founder and chairman of the Aga Khan Development Network (AKDN) a global network dedicated to improving the quality of life of all. It has made substantive contributions all over the world, including in Tanzania where it has a longstanding history. Foundation’s endeavours to increase income opportunities for over 100,000 smallholder farmers and over 9,200 community-based savings groups in Southern Tanzania. “The Aga Khan health services has the country’s top state-of- the-art hospital in Dar es Salaam, as well as five primary medical centres and 8 outreach centres across the country that have provided increased access to health for communities in rural and urban areas,” read further the statement. The Aga Khan University, through the Graduate School of Nursing and Midwifery and the Institution of Educational Development, has awarded over 250 Master’s Degrees and educated over 3,000 trainers in Tanzania. In Zanzibar, the Aga Khan Trust for Culture restored the seafront Forodhani Park and engaged in conservation planning for the Old Dispensary, amongst others, as AKDN promotes culture as a ‘trampoline for change’ for development. The Aga Khan arrived from Kampala where he attended the Independence Day celebration upon the invitation of the Excellency President Yoweri Museveni and was decorated with the highest civilian Ugandan order, The Most Excellent Order of the Pearl of Africa, The Grand Master, for his humanitarian efforts. While in Dar es Salaam, the Aga Khan will also meet members of his community. Dar es Salaam — The founder and chairman of the Aga Khan Development Network (AKDN), His Highness the Aga Khan, is expected in the country today for a two-day official visit. The visit follows an invitation by President John Magufuli. The Aga Khan, who is also the Imam (spiritual leader) of Shia Ismaili Muslims, will visit Tanzania on the second leg of his East Africa tour. According to a statement issued by the Aga Khan Council communication coordinator, Mr Aly Ramji, His Highness the Aga Khan is expected to arrive at Julius Nyerere International Airport at around 10.30am, and will be received by the Minister of Foreign Affairs and East African Cooperation, Dr Augustine Mahiga. The visit is part of a series of tours that coincide with the commemoration of the Aga Khan's Diamond Jubilee commemorating 60 years as the spiritual leader of the Shia Ismaili Muslim community. Jubilees in the Shia Ismaili Muslim tradition have traditionally served as opportunities to launch or advance social, cultural and economic development projects. "The projects include hospitals, schools, universities and financial institutions that serve people of all backgrounds and faiths," said the statement. His Highness the Aga Khan is the founder and chairman of the AKDN, a global network dedicated to improving the quality of life of all. It has made substantive contributions all over the world, including in Tanzania where it has a long-standing history. The AKDN's institutions are among Tanzania's largest socio-economic agencies and impact the lives of all Tanzanians. Some of these examples include the Aga Khan Foundation. "The AKDN has the country's state-of-the-art hospital in Dar es Salaam as well as five primary medical centres and eight outreach centres across the country that have provided increased access to health for communities in rural and urban areas," the statement further said. The Aga Khan University, through the Graduate School of Nursing and Midwifery and the Institution of Educational Development, has awarded over 250 Master's Degrees and provided education to over 3,000 trainers in the country. In Zanzibar, the Aga Khan Trust for Culture restored the seafront Forodhani Park and engaged in conservation planning for the Old Dispensary, amongst others, as AKDN promotes culture as a "trampoline for change" for development. Mawlana Hazar Imam arrived in Tanzania this morning continuing his visit to East Africa in commemoration of the Diamond Jubilee year. On behalf of the Government, Hon. Minister of Defence Dr. Hussein Mwinyi, Hon. Minister of Education, Science and Technology Professor Joyce Ndalichako, and Regional Commissioner of Dar es Salaam, Paul Makonda welcomed Hazar Imam to Tanzania. 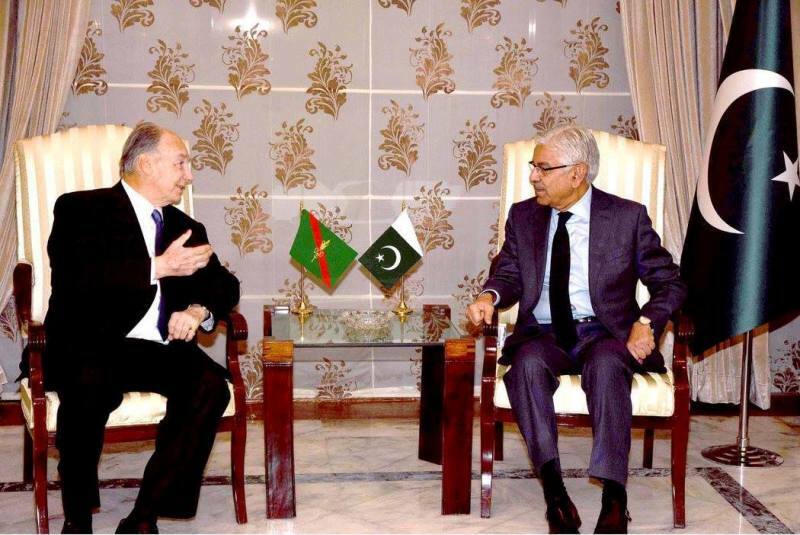 Ismaili Council for Tanzania President Amin Lakhani received him on behalf of the Jamat. AKDN Resident Representative Amin Kurji, Jamati leaders, and representatives from various faiths were also present to greet Mawlana Hazar Imam at the airport. The arrival ceremony commenced with the Tanzania Police Band playing the Nashid al Imamah and the Tanzanian National Anthem. Mawlana Hazar Imam was welcomed with a Guard of Honour and took a moment to enjoy a selection of performances. These included Tanzanian traditional dancers, and a vibrant group of young Ismailis performing a fusion dance showcasing a blend of African and South Asian cultures with dhol and ngoma (traditional drums). Jamati members, along with Aga Khan Scouts and Guides watched with happiness and excitement in the presence of the Imam, and waved as his convoy departed the airport. Mawlana Hazar Imam is in Tanzania at the invitation of His Excellency President of the United Republic of Tanzania John P. Magufuli. Shortly after leaving the airport, Hazar Imam visited the President at State House and was hosted to a lunch in his honour. While in Tanzania, Mawlana Hazar Imam is expected to grace the Jamat with a Darbar to commemorate his Diamond Jubilee year, marking 60 years of his Imamat as the spiritual leader of the Shia Ismaili Muslim community. 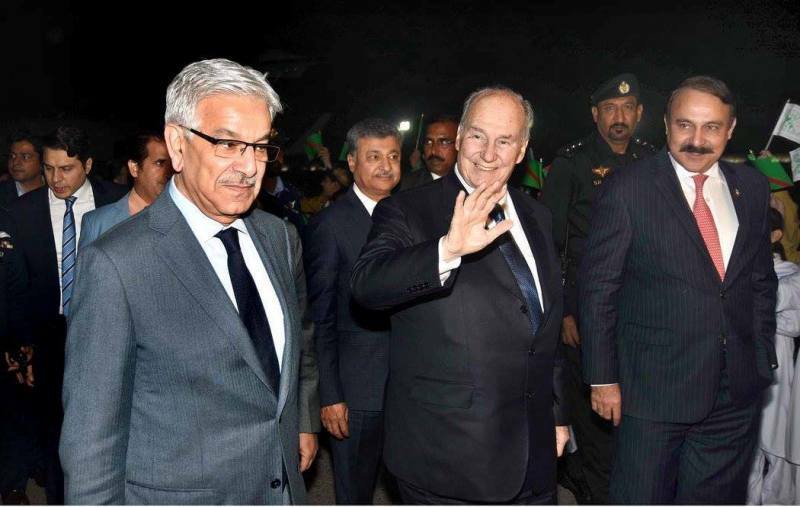 The leader of the world Ismaili community Prince Karim Al- Husayni Aga khan has arrived in the country. 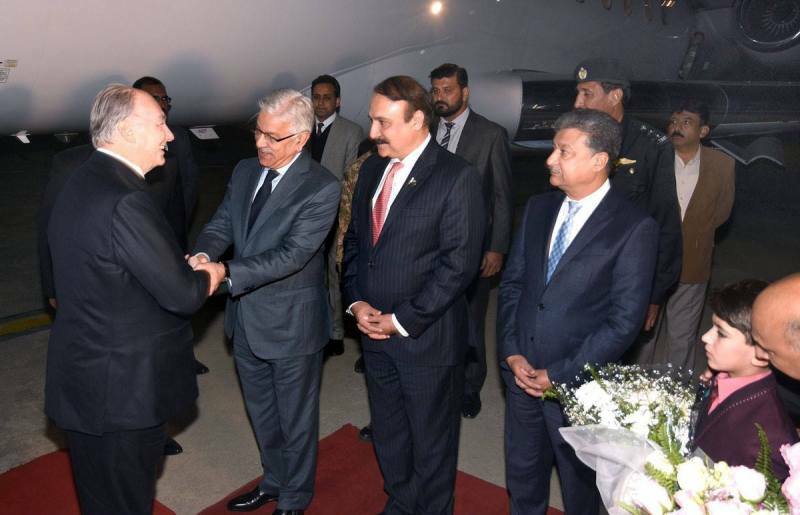 The founder and chairman of the Aga Khan Development Network (AKDN), His Highness the Aga Khan, arrived in Tanzania Wednesday for a two-day official visit. The aircraft carrying him touched down at Julius Nyerere International Airport (JNIA) in Dar es Salaam at 10 am. 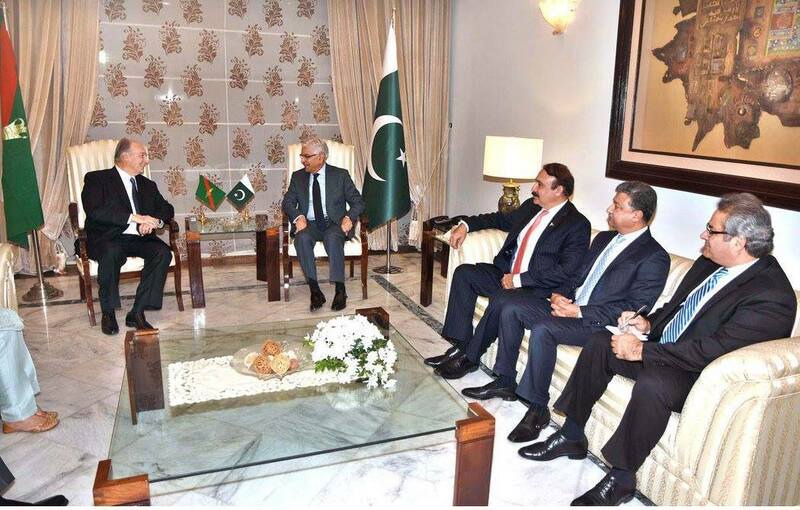 The Aga Khan Council said the visit will open opportunities to various sectors and boost the country’s economy. Cabinet ministers Hussein Mwinyi (Defence and National Service) and Joyce Ndalichako (Education, Science, Technology and Vocational Training) received him. He inspected a guard of honour mounted by members of the Field Force Unit before viewing traditional dances. Others who received His Highness the Aga Khan were Dar es Salaam Regional Commissioner Paul Makonda, religious leaders and AKDN officials. The Aga Khan, who is the Imam (spiritual leader) of the Shia Imami Ismaili Muslims, is in the country on the second leg of his East African tour, and was expected to hold talks with President John Magufuli at State House in Dar es Salaam. The visit coincides with the commemoration of the Aga Khan’s Diamond Jubilee marking 60 years as the spiritual leader of the Shia Ismaili Muslim Community. Mawlana Hazar Imam departed from Tanzania on 12 October after completing his second Diamond Jubilee visit. The Minister of Defence and National Service, Hon. Hussein Mwinyi, and Regional Commissioner for Dar es Salaam, Hon. Paul Makonda, were present for Mawlana Hazar Imam’s departure from Julius Nyerere Airport. Ismaili Council for Tanzania President Amin Lakhani, and AKDN resident representative Amin Kurji also attended to bid Hazar Imam Khuda Hafiz. While in Tanzania, Mawlana Hazar Imam granted the second Darbar of his Diamond Jubilee year, which marks 60 years of his Imamat as the spiritual leader of the Shia Ismaili Muslim community. Before departing, Mawlana Hazar Imam was presented with a gift of First Day Covers and Commemorative Stamps printed by the Tanzania Postal Service Corporation in honour of his Diamond Jubilee. The First Day Covers and Commemorative stamps depict various themes in which AKDN is active in East Africa, as well as the Diamond Jubilee motif. Dar es Salaam. The founder and chairman of the Aga Khan Development Network, His Highness the Aga Khan, yesterday told President John Magufuli that his network will expand the Dar es Salaam Aga Khan hospital and build a university in Arusha. The activities, he noted, would be part of the Aga Khan Development Network (AKDN) contribution to government’s efforts to bring development to Tanzanians, a statement released by the State House on Wednesday said. His Highness the Aga Khan, who held talks with President Magufuli at State House in Dar es Salaam soon after arriving in the country yesterday for a two-day visit, said the expansion of the Dar es Salaam Aga Khan Hospital would see an increase in the number of beds from the current 72 to 172. The visit of His Highness the Aga Khan to Tanzania is the first since Dr Magufuli became President in November 2015. It is part of a series of tours that coincide with the commemoration of 60 years of the Aga Khan’s spiritual leadership of the Shia Imami Ismaili Muslim community. Tanzania issues postal stamps to mark the Diamond Jubilee. KARACHI: All possible assistance, civic amenities and facilities would be provided to the Ismaili community members so that they could organise the Aga Khan’s Diamond Jubilee Celebrations in a befitting manner in the city, said Mayor Wasim Akhtar. He was talking to a four-member delegation of the community led by Amin Lakhani, which called on him at his office to discuss various programmes being organised in connection with the celebrations. He said Prince Karim Aga Khan would be given a warm welcome on his arrival in the metropolis in the first week of December. Special arrangements would be made and all assistance would be provided so that various functions, including the ones at the Aga Khan Park in Clifton, Nishtar Park, Bagh-i-Jinnah, Britto Road in Garden, could be organised properly. He said the civic agency would make special arrangements and roads leading to and around the Jamaat Khanas and the neighbourhoods where the community lived in big numbers, would be cleaned and city wardens would be deployed. Fire brigade staffers as well as rescue services would also be kept vigilant, he said. Paying tributes to the work of the community as well as the Aga Khan Development Foundation in the fields of education, health, culture, heritage etc, he said that people living in many parts of the country benefitted from these projects. Earlier, briefing the mayor on the celebrations, Mr Lakhani said the 49th leader of his community, Prince Karim Aga Khan IV, had completed 60 years of the Imamat. He was given this position as a successor of his grandfather Sir Sultan Mohammad Shah Aga Khan III on July 11, 1957. He said the diamond jubilee celebrations were being organised from July 2017 to July 2018 around the globe. Islamabad: Gilgit city, and by extension the entire Gilgit-Baltistan region, has been pleasantly calm during the last four years. Not even a single incident of sectarian violence has erupted. Religious and social leaders, aided, and sometime pressed, by government and administration officials, have been making very positive statements, and taking increasingly encouraging steps to sustain harmony in the region. Law enforcement measures have also been tightened during the last couple of years, maintaining law and order, which has resulted in booming of tourism and trade. The same spirit of pluralism is at display ahead of the arrival of the Shah Karim Al-Hussaini, the Aga Khan, 49th Imam of the Nizari Ismaili sect of the Shia Muslims. The Aga Khan is scheduled to visit the Gilgit-Baltistan and Chitral region, along with other parts of Pakistan, starting next week. During his visits to different parts of the mountainous areas, the Aga Khan will address hundreds of thousands of his followers in different specially prepared grounds as part of his Diamond Jubilee celebrations. This occasion is harbinger of festivity for the Ismailis, but it has also stirred great interest and positive commotions among the Ithna Ashari and Sunni Muslims who live side by side, sometimes coming from the same families. Prince Karim Aga Khan, the spiritual leader of the Shia Ismaili Muslims, is scheduled to arrive in Islamabad today (Thursday) for an official visit at the invitation of the Government of Pakistan. While in Pakistan, he is expected to meet with President Mamnoon Hussain, as well as Prime Minister Shahid Khaqan Abbasi and other government leaders, said a news release. This visit is part of a series of visits that coincides with the commemoration of the Aga Khan’s Diamond Jubilee, which began earlier this year on 11th July. The Diamond Jubilee marks 60 years of his Imamat as the spiritual leader of the Shia Ismaili Muslim community. The Aga Khan acceded to the Ismaili Imamat on 11th July 1957, succeeding his grandfather, Sir Sultan Mahomed Shah Aga Khan. ISLAMABAD: His Highness Prince Karim Aga Khan, spiritual leader of the Shia Ismaili Muslims, is scheduled to arrive in Islamabad on Thursday, 7th December for an official visit to the country, at the invitation of the government of Pakistan.According to a press release while in Pakistan Prince Karim Aga Khan is expected to meet with President Mamnoon Hussain as well as Prime Minister Shahid Khaqan Abbasi and other government leaders. This visit is part of a series of visits that coincide with the commemoration of the Aga Khan’s Diamond Jubilee which began earlier this year on 11th July. The Diamond Jubilee marks 60 years of his Imamat as the spiritual leader of the Shia Ismaili Muslim community. The Aga Khan acceded to the Ismaili Imamat on 11th July 1957, succeeding his grandfather Sir Sultan Mahomed Shah Aga Khan. prince karim aga khan ki amad sy qabal tarkiyati kam jari. Sewage lines being fixed in Garden East! prince karim aga khan visit to pakistan.